Setting up the controller was a breeze. After connecting it to iPad Pro using Bluetooth, we were prompted to download the SteelSeries Nimbus companion app on the App Store. The controller connected instantly after doing so and started functioning correctly as soon as we opened "Fortnite." It shouldn't be a big surprise that using a control surface other than a touch screen is the way this game is meant to be played. Gameplay and controls are incredibly smooth. Being able to aim and fire with the controller buttons made it so much easier than using the old touchscreen controls, thanks to the recent iOS 12.1 update that enabled those buttons. However, we did run into an issue where we could not crouch because the thumbsticks are not able to act as buttons on a press. Other than that, all of the controls worked flawlessly. You can easily connect an external display to the 2018 iPad Pro with USB-C, and play on the big screen while sitting across the room using a controller. While the iOS game catalog is still somewhat less than optimal for gaming on a giant television, this can make the iPad Pro a gaming console on its own. 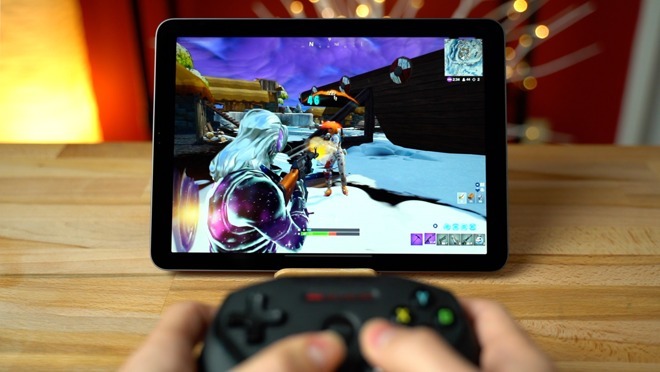 Connecting the controller to the iPhone XR was just as easy as it was for the iPad Pro, and it worked correctly as soon as we got into a "Fortnite" match. We did find it a little hard to see players at a distance on the iPhone compared to iPad Pro, which has a much larger display and higher resolution. Nevertheless, the $750 iPhone XR had no issue running the game at 60 fps and high settings. We did experience a couple of dropped frames here and there, but overall, it performed incredibly well. 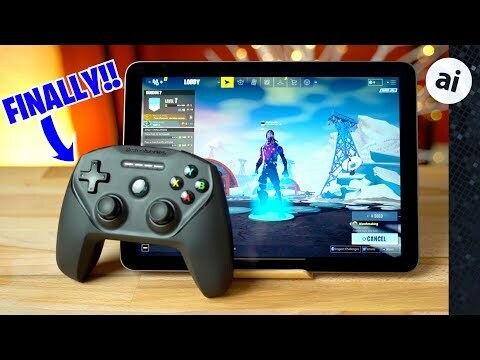 Anyone who enjoys playing "Fortnite" mobile or other iOS games with controller support should buy an MFi controller. 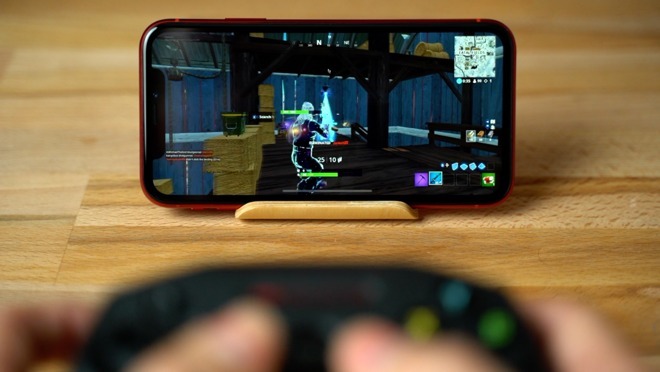 Compared to playing with touchscreen controls, playing with a controller offers the best "Fortnite" mobile gaming experience you can get. The outstanding performance of both the A12 and A12X processors make the gaming experience comparable to playing on a dedicated console. The SteelSeries Nimbus controller is currently on sale on Amazon, priced at $44.99. With rumors of Apple's game subscription service in the works, investing in an MFi gaming controller now would not be wasted in the long run. (I don't care if i sound repetitive) NO FORTNITE APPLE TV SUPPORT!? Like WTF? Apple really dropped the ball this gen.
Why would this be an Apple problem? Seems like it's an Epic decision of whether or not to support Apple TV.....unless I missed something. This is 100% on Epic. There is no Apple-induced reason for them to not port it. The old max file size restriction has been lifted. I think the problem is Apple making the Apple TV less desirable to develop for. Let me throw your question right back at you. why HASN'T Epic developed for Apple TV(and nearly every major developer)? Epic is tossing Fortnite onto every console available BUT the Apple TV. Why? Apple has always had a counter-productive relationship with game developers, dating back to the Mac. Gaming is a $100 billion industry! They are getting it right on the iPhone but not on Apple TV or the Mac... why? And also ... release a darn controller already - they could probably get a product on the market in a few months ... my guess is game controller margins are at least 100% ... this is a no brainer. My Grandkid just tried it on his Gen6, 2018 iPad and gave it a thumbs up. 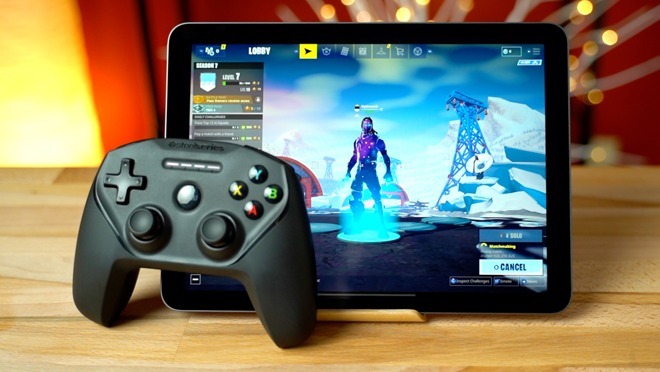 While he seems to prefer his Xbox with a 4K TV he had no complaints about Fortnite on his iPad with the Nimbus controller -- except "The screen is small". I agree - I actually own a Nimbus. The build quality is very good and it works seamlessly. But I think Apple creating its own controller (with a glowing Apple logo on top) would be more of a symbolic gesture that they are finally serious about gaming (beyond the casual mobile gamer), and send an important and necessary positive message to game developers. And we could have, seamless pairing like on AirPods, and maybe wireless charging for AirPower. And an even more seamless support for games! lol...did we really need an article to tell us that playing a game that requires quick reactions with complex button inputs is better wuth physical controls? How silly. Does EPIC filter games so that those playing with thumbsticks arent playing against those on just touch-screen? A commenter on the AI forums mentioned that those using controllers on mobile automatically get matched up with Nintendo Switch players instead of touchscreen mobile players. I'm not 100% sure though. Hmm, trying to get to this work on iphone max but getting an input blocked when in game. Updated firmware as well.. Will have to mess w/ it more later. Worked fine in the menu, but gameplay seems to not be working for me for some reason. Try restarting the game and then try using the controller's buttons to search for a match instead of using touchscreen controls. Hmm, trying to get to this work on iphone max but getting an input blocked when in game. Using the same controller and updated firmware as well.. Will have to mess w/ it more later. Worked fine in the menu, but gameplay seems to not be working for me for some reason. Thanks, will try and sorry for the multiple posts. My Grandson thought it was fine when he used it to play Fortnite today on his Gen6 2018 iPad. Actually, his whole critique consisted of: "It's fine" -- which I took as raging approval.